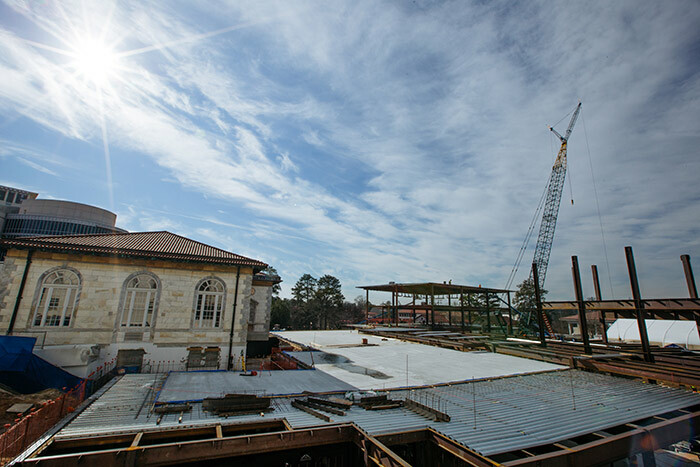 With extensive site preparation and foundation work in place, the construction of Emory’s new Campus Life Center (CLC) continues on pace this semester with the installation of massive steel beams that will provide the architectural bones of the new facility. Students returning to campus from the winter break were met by the emerging outline of the CLC’s south pavilion. 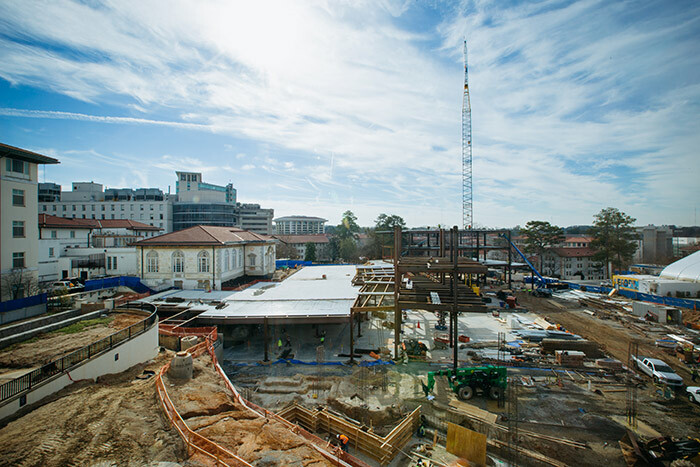 “If you’re standing inside the first floor of the south wing, it’s really starting to look like a building,” acknowledges Ben Perlman, director of the University Center. In addition to last semester’s visible site preparation — which included the removal of massive quantities of dirt to adjust the grade — construction crews have built a new loading dock tunnel, relocated utilities, installed a new water line for the historic Alumni Memorial University Center (AMUC), relocated both underground steam and chilled water lines that ran through the construction site, and installed concrete footings, concrete grade beams and shoring walls. That was all in preparation for the installation of foundational concrete slabs and walls and the first steel columns and beams, which are now rapidly rising. And that’s no small achievement, given the challenges posed by recent weather, which included the remnants of two hurricanes earlier last fall, a snowstorm in December and unusually frigid temperatures and more snow over the past few weeks. “I give credit to the steel workers who have really worked hard out there, even in bitterly cold weather, sleet and drizzle,” says Al Herzog, Campus Services project manager for planning, design and construction. “Despite the challenge of inclement conditions, they’ve been making significant progress,” he reports. Work began last summer on the new CLC, which is slated to open in May 2019, with the demolition of the Dobbs University Center — among the largest campus tear-downs of its kind seen in recent years. Developed in partnership between Emory’s divisions of Campus Life and Campus Services, plans for the new structure were driven by growing space needs, a desire for more flexible and efficient dining services, and the need for more room for student organizations and gathering spaces. 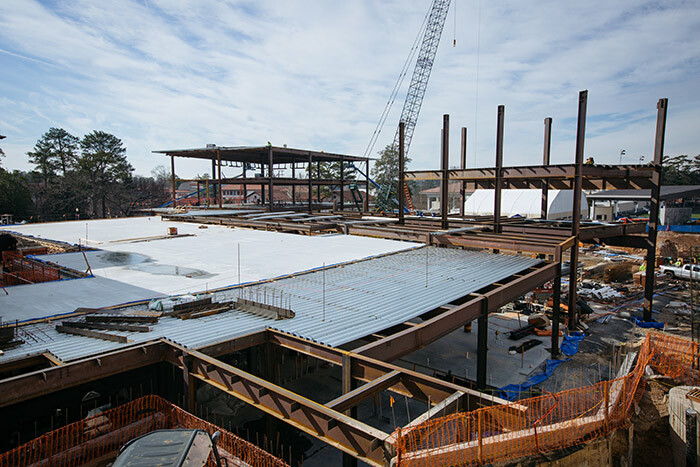 Once completed, the three-story building will cover nearly 115,000 square feet, featuring student lounges and recreational spaces, a campus restaurant with approximately 800 seats, and a nearly 1,600-seat multipurpose room. “I leave Emory this year knowing that this project will transform campus life for many years to come,” says Ajay Nair, senior vice president and dean of Campus Life, who will become president of Arcadia University in Glenside, Penn., on April 2. “Equally important, it represents the collective input, ideas and effort of countless members of our Emory community. It is one of the most important projects I've engaged with in my career,” he says. From the project’s inception, the CLC’s design has been shaped by input from Emory students and the broader campus community. This semester, that practice will continue as the focus turns to interior spaces. “Behind the scenes, we’re starting to look at the interior design, furniture and audiovisual design selection process,” Perlman says. Although the University Center already works with students through advisory boards and committees, this semester it may also invite students to weigh in on interior design options through online voting. “We really want to make sure we’re making choices that represent a large spectrum of the student body,” Perlman explains. Last month, Emory students were also invited to literally leave their mark on the new center with an event that allowed them to sign their names and messages on a steel beam destined to become part of the CLC’s north pavilion. More than 500 students turned out for the beam-signing event, which coincided with a late-night study break. Once in place, the beam will not be visible, but a plaque will be installed nearby to commemorate it, Perlman says. In other developments, plywood that was installed last year to protect the western face of the AMUC has been removed, fully exposing the building for the first time in years. Students will also find that a new doorway has been installed on the southwestern corner of the AMUC to provide easier access, Perlman says. One of the more unusual challenges faced by construction crews has been removing Emory’s Sesquicentennial Time Capsule, a large concrete box that was buried just steps away from the DUC terraces in 1986. Intended to honor the 150th anniversary of Emory’s founding, the time capsule was filled with 150 items, believed to include cans of Classic Coke, Cherry Coke and Diet Coke; a copy of a speech by then-President James T. Laney titled “The Education of the Heart”; a Chemistry 141 exam; a videotape of a Rathskellar performance; and a signed photograph of Emory’s first intercollegiate basketball team. Since the original plan was to unearth the time capsule in 50 years on Emory’s 200th anniversary, that intention will be honored. Now in storage, the capsule will eventually be replanted in a campus location at a later date, Perlman says. Moving forward, work at the CLC site will progress south to north — from Alabama Hall towards Raoul Hall. 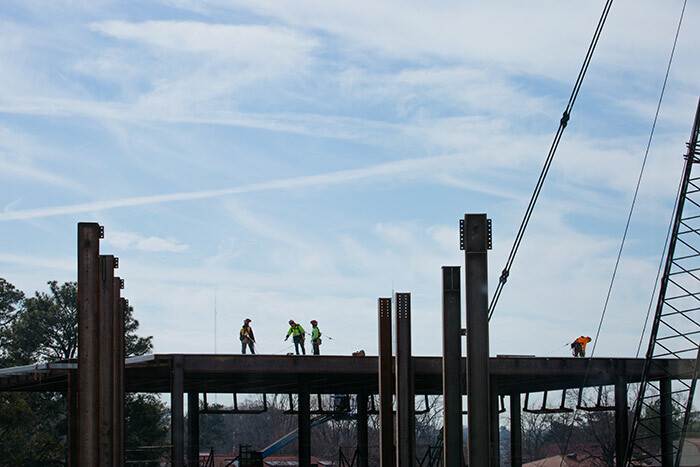 Spectators can expect to see more concrete pours this semester and the continual rise of steel beams and columns as the building grows, floor by floor, Herzog says. For more information on the project, visit the CLC website, which offers construction updates, ongoing news coverage, frequently asked questions and an opportunity to subscribe to e-newsletters.